The first editor we’ll look at is Brackets. Brackets was formerly known as Adobe Edge Code, and was only available as part of the Adobe Creative Cloud. Adobe has since transformed Brackets into a free and open source text editor, but don’t think that they’ve downgraded it. 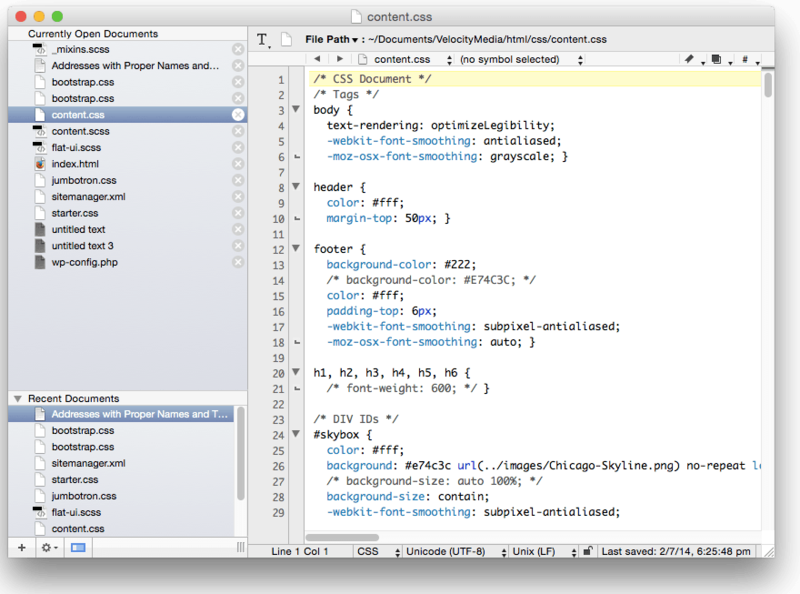 Like all of the editors I’m reviewing, Brackets features code coloring and highlighting, automatic tag closing, and full featured search-and-replace. 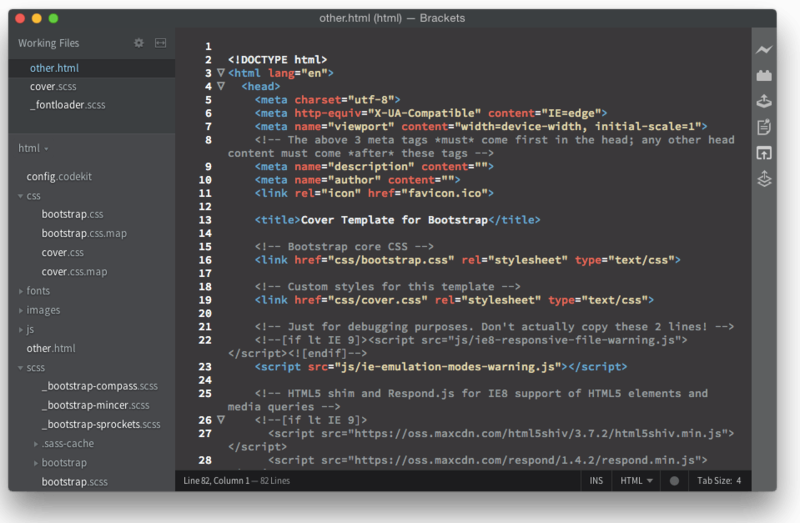 One of the strongest features of Brackets are the plug-ins available that extend the editor to include more features such as code hinting for different frameworks, FTP functionality, time tracking, and more. Brackets also features a side-by-side editor for comparing or editing two files at once. You can also choose between a light theme with dark text on a white background, or a dark theme with light text on a dark grey or black background. Brackets is available for free from brackets.io, and is available for Mac, Windows, and Linux. The next editor we’ll look at is Sublime Text. Sublime Text is a feature-packed editor that, like the others, includes code coloring and highlighting, automatic tag closing, and a plug-in architecture that lets you extend the functionality of Sublime Text. But what Sublime Text has that the others don’t is a powerful multiple-selection feature that lets you find, highlight and change multiple instances of text, tags, or variables all at once. Sublime Text also has a side-by-side split editor for comparing and editing two files at once. Sublime Text is available as a full-featured free evaluation download, but there is a $70 charge for a license. There is no time-limit to the evaluation, but you will be prompted quite often to buy a license, particularly when saving a file. If you enjoy using Sublime Text, I highly suggest buying the license. It’s well worth it. 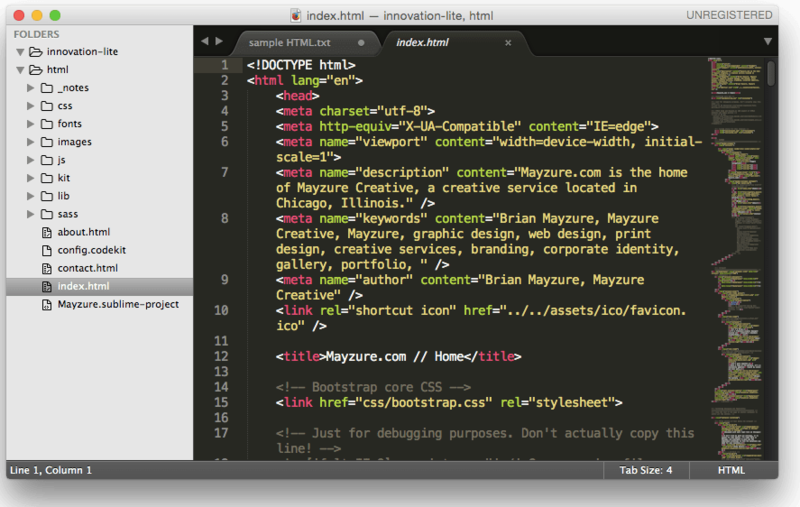 Sublime Text is available for Mac, Windows, and Linux. TextWrangler, while not as full-featured as it’s paid sibling BBEdit, is still a very capable and handy free editor. TextWrangler was one of the first editors I downloaded on my ancient-but-still-kicking 2009 MacBook when it was new. It’s the younger sibling of BBEdit from Bare Bones Software, one of the oldest full-featured text editors available on Mac, going all the way back to 1993 when it was introduced for Mac’s System 7. Like the others, it also includes a side-by-side split editor for comparing and editing multiple files at once, as well as a very capable find-and-replace function. The biggest perk of TextWrangler is that it’s available as a free download, while it’s more-capable sibling, BBEdit, will set you back $49.99. TextWrangler is available only for Mac. NotePad++ is a Windows-only application that is quite handy as both a coding tool and a Notepad replacement. And not to leave out my Windows friends, NotePad++ is a full-featured editor. 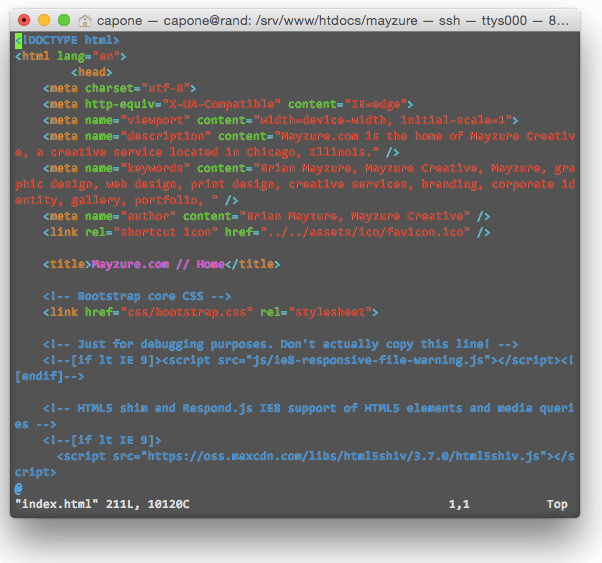 Like the others, it includes code highlighting, code hinting for a variety of languages, and well as side-by-side editing. You cannot change the theme, so dark text on a white background is the norm here. NotePad++ has been around for many years, so this application is rock-solid and reliable. If you’re looking for a Notepad replacement on Windows, I highly suggest NotePad++. I’ve used it for many years, and my only wish is that it were available on Mac as well. 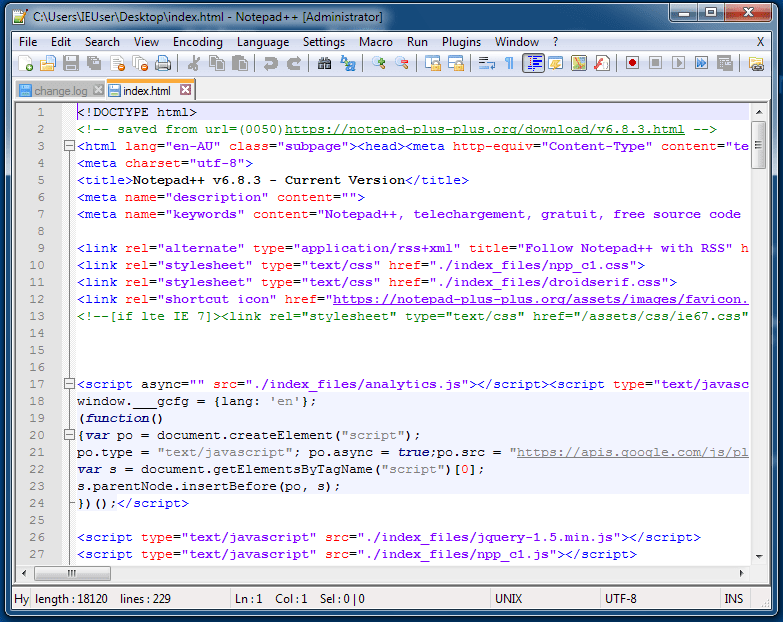 NotePad++ is available as a free download for Windows. Vim is a full-featured command-line editor that originated on Unix/Linux. There is a steep learning curve, but well worth it if you are a power user. Ports are available for Mac and Windows. And for those Linux/Unix users who feel that coding should be hard because life is hard, there’s the vim editor. Vim is the descendant of the vi editor, and is surprisingly feature-packed once you get used to it. There is a steep learning curve for this command-line editor, but well worth the time spent learning the commands. I have a personal Linux server that I use as a testing server for serving webpages (as well as being a file server and home media server), and learning vim has been useful when making a quick edit to HTML, or to configuration files on the server. Vim comes standard with almost all distributions of Linux, FreeBSD and OpenBSD. And for the technie-inclined, there are also ports of vim to both Mac OS X (MacVim) and Windows (gVim) available to download. This entry was posted in Reviews and tagged Applications, authoring, development, Editors, Linux, Mac, Text Editors, Windows. Bookmark the permalink.